How to snap a tow bar. Its ‘on the road again’ day as Willie Nelson so eloquently put it, the day when we say good-bye to our newest friends here in northern New South Wales and head off on another Travel Australia house-sitting assignment, 750 kilometres south to Bowral, 110 kilometres the other side of Sydney. We were pretty well organized the day before our departure from Grafton and Julie went through her routine of purifying the house from floor to ceiling. Over previous weeks I’d made a few improvements to the van, installing a carpet off-cut to make the cabin as quiet as practicable and fitting a volt meter and the remote control for our (apparently ‘over-kill’) battery charger / inverter into the dashboard. Years of experience with our ex-trawler led me to over estimate the power requirements of a camper-van, embarrassingly so. Our petrol powered generator produced more than a hundred times the power of the solar panels that most caravaners use and the inverter needed that kind of power to drive it’s 9,000 watt needs, which we used to power our domestic bar fridge etc. It was all wrong. We stopped at Coffs Harbour, an hour from Grafton and about 4 hours from Brisbane. This city of 70,000 people was on the stop list so we could do a tyre upgrade, which was completed while we did some shopping for essentials. In planning the trip to Bowral we’d made the ‘decision’ or what passes for a decision anyway, to stay in a National Park camp ground called Mungo Brush. We could cover the 400 kilometres in one day easily, hopefully stopping about 3pm to enjoy some peace in a quiet camp before moving on the next day. As if I needed any reinforcement to the notion that planning was a waste of time, our arrival was impeded by missing the first turn off and having to travel an extra 40 kilometres, inducing a little frustration. To exacerbate our irritation, we discovered that National Parks in New South Wales no longer belong to the nation and have been re-evaluated by the bureaucrats as a commercial enterprise that charges rent to the owners (the people) should they wish to access their property. A patch of grass to rent for one evening was $28 and included in this generous offer, you were allowed to walk the 100 metres to the toilet. In any case, although surprisingly few people had seized upon this, one was not permitted to use a generator regardless of the time, its possible nuisance value or proximity to others. It’s just a ‘rule’. As our house battery ran out of puff altogether, partly due to my over engineered inverter, we had to reluctantly turn away from their kindness and find a free camp for the night where we could do as we bloody-well please. So it was another 32 kilometres back to the highway and another 20 kilometres to a rest area in which another bureaucrat had erected a large sign proclaiming ‘No Camping – Penalties Apply’. Naturally we parked under the sign as it was just a convenient distance to the toilets, as did several other travellers who needed a safety rest. I had never bothered to time the passing of trucks or trains for that matter, but this night I was interested to note that the Pacific Highway has a large truck pass any given point every 18 seconds. I also discovered it’s amazing what the sleepy brain can do with half a bottle of red. We slept well and had a hearty breakfast before we hit the road again. By mid-morning we were about 25 ks north of Gosford and pulled into the Jilliby truck stop for fuel but missed the entry and ended up in the parking area. 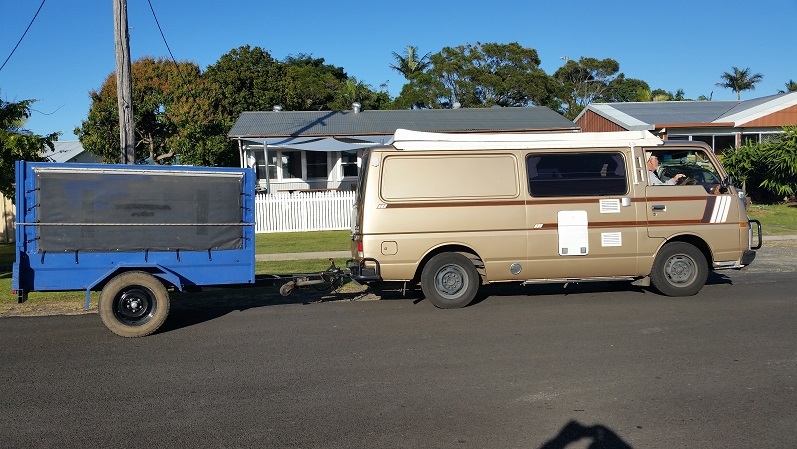 We weren’t desperate for fuel but this was a good chance to check the trailer and tow-bar which seemed to have developed a vague clunk, so we unhitched the trailer to check the attachment brackets I had designed in Adelaide. Everything looked fine and the bolts had virtually no room to be further tightened so after a morning coffee we took off again, the trailer giving an ominous clunk as we pulled away, perhaps even a little louder than before. The voice of experience was sitting on my shoulder but warning of what? Experience is really useful because it lets you recognize a mistake when you make it again. Fifteen minutes and 30 kilometres later we were most of the way up Calga, a huge hill on 6 lanes of traffic when I glanced into the rear-view mirror and saw the roof of the trailer. This could only mean the trailer’s draw-bar was literally dragging on the bitumen. The side lane was barely wide enough for us to pull over, just outside the lane marking. This was going to be a small problem, not least because the traffic was so close we couldn’t open the driver’s side door for more than a few seconds at a time. We were pinned against the wall with very little room between us and the trucks. The survey of the scene revealed that the round pipe crossbar that formed the main part of the tow-bar had snapped close to the middle near the tow-ball. The trailer was still hanging onto the ball for dear life, but the ball and that half of the pipe was now pushed firmly under the van when we braked to pull over. The other half was still sitting up, as if to say, ‘where’s me mate’? This situation called for another cuppa and a bit of a think, but first we put a couple of rocks behind the wheels and left the trailer clinging onto the ball. With another 200 kilometres to go, the option of rescue, we ruled out almost immediately. No one was coming to help. This was going to require some bush engineering, so after contemplating our options for a few minutes, I used an angle grinder to square up the ragged ends of the tow bar to prepare them for inserting a smaller diameter pipe I just happened to have under the bed. After spray painting an inch or so around the middle section of the smaller pipe I pushed it almost all the way into the end of the tow-bar that was still essentially in the normal position. The next step was to put more chocks in front of the trailer wheels to stop it from moving forward and then drive the van forward about 200mm to bend the bar back into approximate place to realign the pipe ends. After jacking the draw-bar back to normal height, using a small sharp metal scriber, I inched the inner pipe into the other side until the painted area came into view in the gap and so I knew it was in the centre. Then it was just a matter of drilling and driving in a couple of metal cutting bolts to keep the inner pipe in place. Easy fix. Once I rewired the trailer plug wires that had been ripped out, we were done. 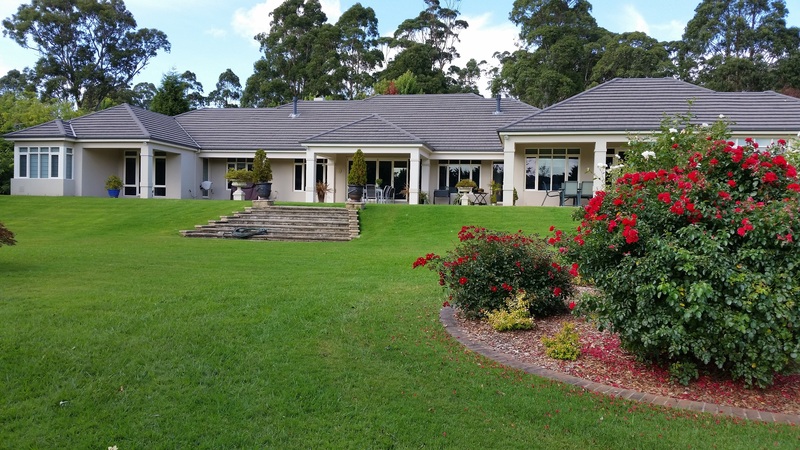 Within an hour and a bit we were able to get moving and it was fine for the 90 kilometres into Sydney and then the last 110 kilometres to Bowral. We stopped for a coffee when we got to Mittagong, about 11 ks north of Bowral and called Bruce and Diane to let them know we were almost there and surprisingly, on time. After such an interesting day it was great to meet them again and also to see Arthur and Olive who were to be our in-house neighbours for the next 5 weeks. We will meet them in the palace in the next article. Wow! Have you left Tassie already???? Goodness that was quick… Though you were here until July…. No, we’re still here in Hobart, just haven’t caught up with my articles. Still have to write the Bowral story and of course Derby.